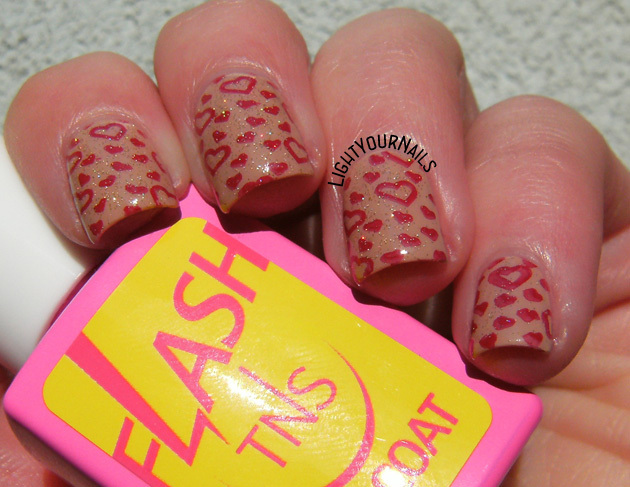 A neutral Valentine | Light Your Nails! Hi everyone and happy Valentine's day if you are celebrating! I had no time for preparing a fancy mani so here's my quick and easy idea. I started with a neutral base which is TNS Cosmetics Light Touch and I stamped plenty of hearts on top of it with a special red stamping polish and MoYou London Pro Collection no. 08 plate. Since it was kinda boring on its own I added some sparkles with China Glaze Golden Enchantment and I'm ready to go! Ciao a tutti e buon San Valentino se vi piace festeggiare! Non sono riuscita a preparare una nail art particolare per mancanza di tempo, quindi ve ne propongo una semplice e veloce. Come base ho usato uno smalto color carne, TNS Cosmetics Light Touch, e ci ho stampato sopra tanti cuoricini con uno smalto rosso e la piastrina da stamping MoYou London Pro Collection n. 08. Per finire un tocco di brillantini a dare più luce con lo smalto China Glaze Golden Enchantment. That was it! Quick and easy! Are you doing anything special today? Me, nothing fancy, but I bought some heart-shaped red colored pasta and I will cook something around it. I only hope my boyfriend has no urgency calls from work! See you tomorrow with the ABC challenge and letter E! E questo è quanto! Semplice e veloce! Avete qualche programma particolare per oggi? Io nulla, però ho comprato dei ravioli colorati di rosso a forma di cuore e cucinerò quelli. Spero solo che non chiamino la mia dolce metà a lavorare! A domani con la lettera E dell'alfabeto! ...è carinissima questa nail art!!! Bello! Come è questo top coat? Io lo vorrei provare! Sono ancora perplessa... asciuga rapido quanto il Seche ma mi da l'impressione di farmi durare poco la manicure. Devo testarlo ancora un po'. Se si usa lo stamping, mi sembra giusto ripiegare in mancanza di tempo ;) Molto carina! We don't celebrate this day, but still my husband and child we went out in a restaurant! As about your nail art is cute! These are so cute! I hope you had a lovely Valentine's day! This look came together so cute!